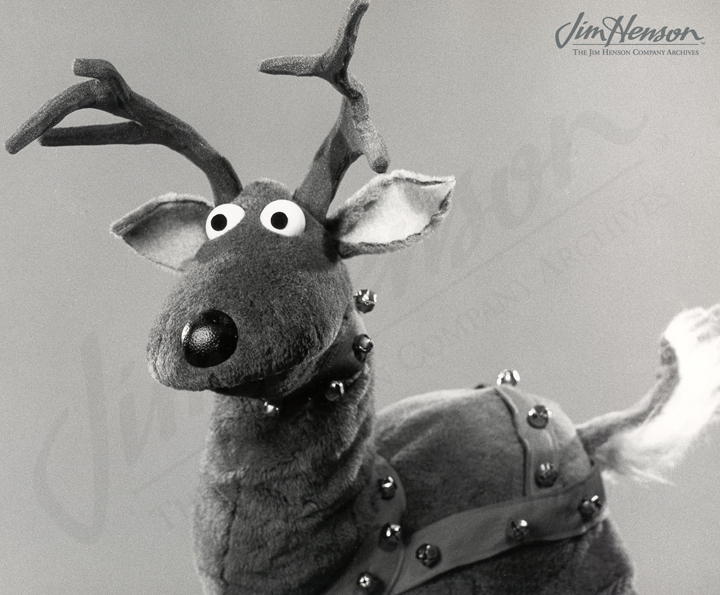 In 1965, Jim and Jerry Juhl got the idea for a sketch featuring a troop of goofy reindeer that would work well for a five-minute appearance on Perry Como’s Christmas show scheduled for December 20th. 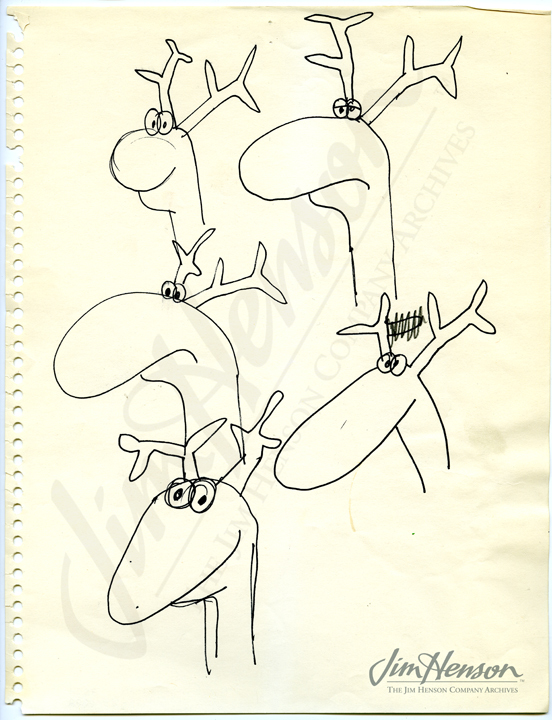 The first draft of the script was ready by mid-November, and Jim designed the puppets which were then built by Don Sahlin. In the bit, as they were led forth in military fashion by their leader Charlie, the other four reindeer — Dancer, Prancer, Donder and Blitzen — sounded off and cracked a few jokes. Calling his squad “twig-heads” and “branch-brains,” Charlie exhorted them to get serious and figure out how to make it snow. Jim and Jerry reveled in using every “snow” pun available (snow use trying to pretend you don’t know any!) 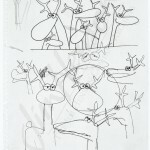 and had the reindeer do a snow dance. The result was rain – they were reindeer after all – but eventually, they met with success and were buried in a pile of snow. In 1968, Jim contracted with Ed Sullivan to do six appearances on his show. Even though the Muppets had appeared on Sullivan’s show about a dozen times during the previous two years, it appears that Jim did not commit right away for 1968. He was working on an array of experimental film pieces at the time and may have wanted to focus his efforts in that arena. 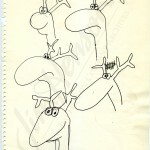 In a note to Jim accompanying various contracts, his representative Bernie Brillstein wrote, “I am glad you have decided to take the six Sullivan shots for next year for, as you know, I feel you need television exposure.” Brillstein really understood the long-term potential for the Muppets and while supporting Jim’s other efforts, wanted to make sure they were in the best position possible to sell a Muppet variety show. 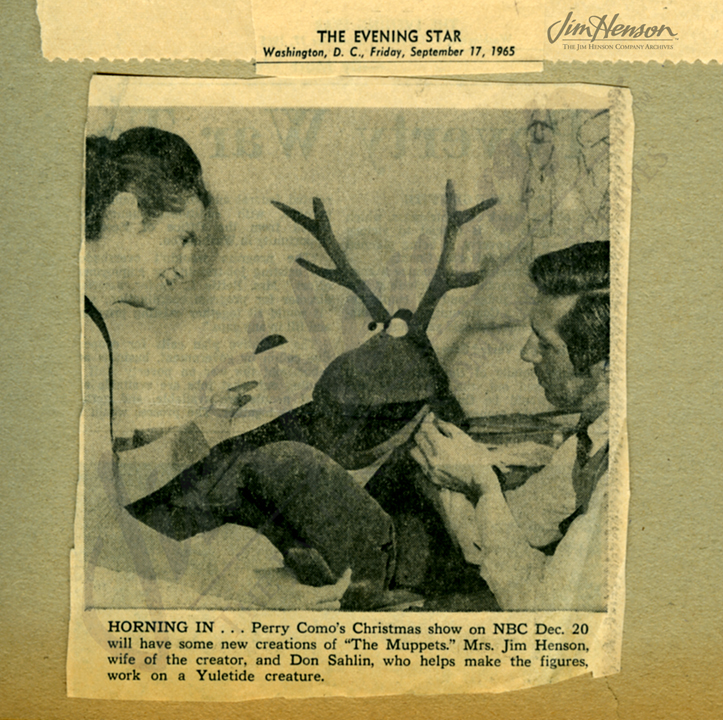 So, for December 1968, Jim and Jerry Juhl dusted off the script from their earlier Reindeer appearance, which had been well received on Como’s show, and, making a few small revisions, readied the bit for Sullivan. With Frank Oz, they arrived at the Ed Sullivan Theatre at the corner of 53rd Street and Broadway on December 22nd and, lining up the reindeer troops, made it snow inside. See a sample of another Muppet Ed Sullivan Show appearance. 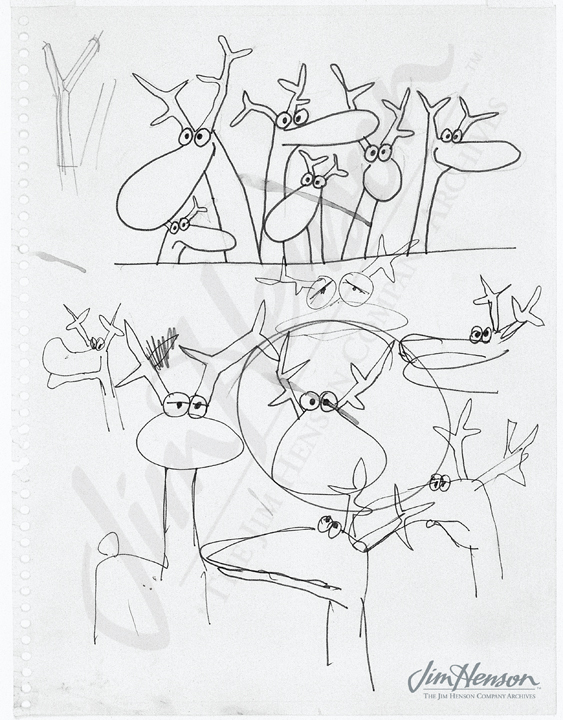 Jim’s designs for reindeer puppets, 1965. Jane Henson and Don Sahlin shown readying a reindeer for his debut on Perry Como’s Christmas show, 1965. 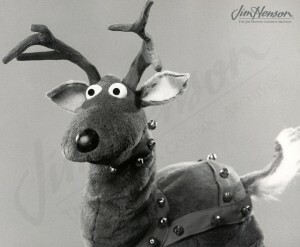 A reindeer puppet, ready for action. 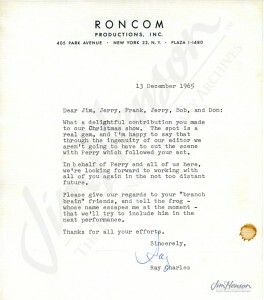 Letter from Como producer (and future Muppet Show musical director) Ray Charles, 1965. 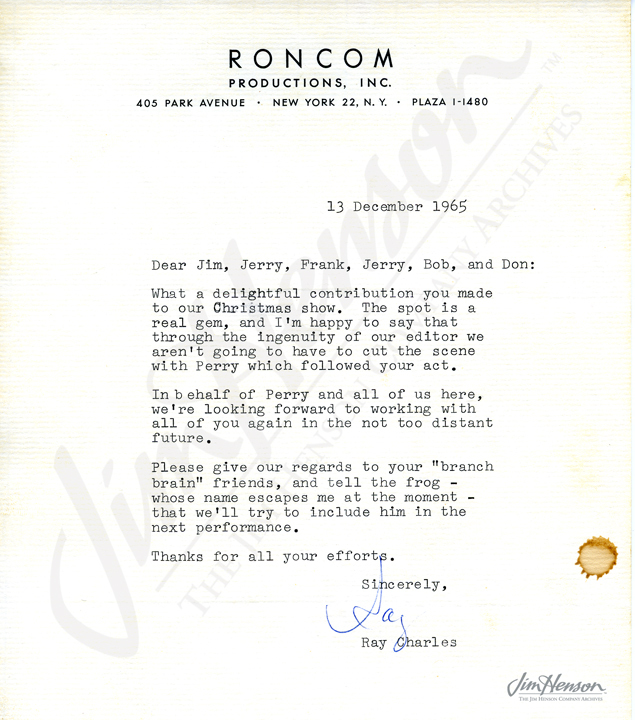 This entry was posted in 12-December '68, 1968 and tagged Don Sahlin, Ed Sullivan, Ed Sullivan Show, Ed Sullivan Theatre, Frank Oz, Jerry Juhl, Muppets. Bookmark the permalink.